BOLINGBROOK, IL (January 20, 2015) - Tillers Direct's rankings algorithm is back to help shoppers pick the perfect tiller. The online retailer and reviews site ranks more than 60 tiller models and publishes more than 880 reviews from real customers who shop the site. Tillers Direct's algorithm generates a certain letter grade for each individual model, providing the most comprehensive 2015 rototiller lists available online. People are unique, which means they have view points on what the word "best" means. Tillers Direct's lists can be sorted in three different ways. 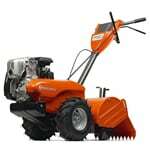 Visitors can sort the tillers by best selling, top-rated, or expert recommended models. Once sorted, the user can then easily filter the results to narrow the selection even further. Tillers Direct didn't just create one list for all tillers though. The site actually created separate lists for each different style of tiller, ranging from electric cultivators to burly rear-tine tillers. Most best-selling lists out there get updated once a year at best, showcasing discontinued tillers that were popular last year. To bring visitors more value, Tillers Direct updates their lists in real-time, highlighting what’s hot and what’s popular at any given moment in 2015. “Best of all, actual garden tiller users influence the algorithm daily. If you don’t agree with our letter grade, you simply submit a review, which instantly alters the ranking,” said Crewe, who works first-hand with all of the top tiller manufacturers and actual customers in order to recommend the highest quality tillers. TillersDirect.com doesn’t require you to sign-up for a membership or subscription. The retailer is simply aiming to educate shoppers with free information, in order to help them pick the perfect rototiller. "We're so passionate about tillers that we're delighted to share this valuable information for free," said Crewe. Tillers Direct announces the best tiller 2015 and the top tillers 2015. The product experts chose the best tillers 2015 based on sales history and customer reviews. Read recommendations on the 2015 best rototillers from the experts who work with them every day.